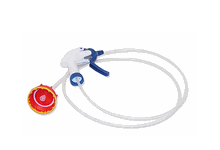 The S100 Trigger Spray Hose works with S100 5 Liter containers. Eliminates the need to transfer product to smaller container. Use the S100 Trigger Spray Hose to make detailing easier. Save money by buying S100 products in 5 Liter jugs. Then save more because you don't have to buy secondary spray bottles. Just attach the S100 Trigger Spray Hose. allows me to spray mike bike more and easyer times, very convinent.